Zach Frechette, co-founder of GOOD Magazine, just launched Quarterly, a subscription service for wonderful things. For 48h, starting now, you can sign up and take their Public Beta for a spin. Quarterly is a subscription service that enables people to receive physical items in the mail from influential contributors of their choice. Yes, this service is about the magic of receiving physical mail. Subscribe to a ‘Quarterly Contributor‘ and then just sit back and wait for that first surprise mailing in your mailbox. Just imagine, getting your mail after a long day at work and discovering a Quarterly surprise between all of those catalogs and bills. Lovely concept, right? I have been a subscriber for their non-public beta and let me tell you, I felt like a kid under the christmas tree every single time I opened one of these. 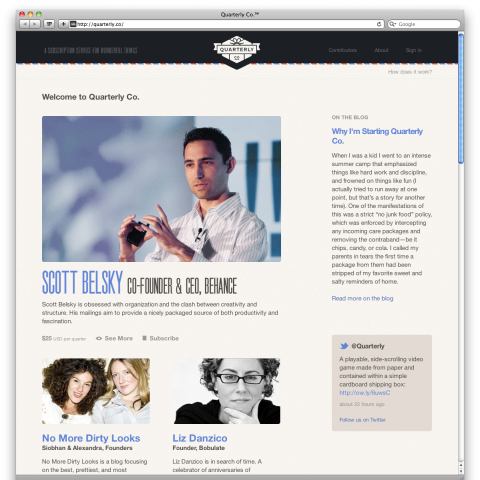 The current contributors are Scott Belsky, No more Dirty Looks, Liz Danzico, Alexis Madrigal, Geoff Manaugh, Maria Popova, Bobby Solomon and moi. Keep in mind that you can subscribe to more than just one person. For now it’s US only but their plan is to add international destinations soon. Check out the contributors. Read the about page for all the questions you might have.